In a small Welsh community it seems that nobody has been able to escape the aftermath of World War I. The town sent away their men to the trenches to fight for their country (or more precisely perhaps, the one next door) and many got back only telegrams and photographs of crosses in a foreign land. Mothers fight to get their sons’ names onto the war memorial, one even blaming the flu that the ‘men’ brought back for the death of her boy who stayed home throughout the conflict. Mediums and con-artists make a lucrative living pandering to the needs of those desperate to contact loved ones on the other side and young women who’ve lost their fiancés face future spinsterhood with stoicism. Non (Rhiannon) Davies is considered one of the lucky ones – the man she married just a year before he went away came back to her physically undamaged but far from the man she knew. She watches his early morning rituals as he cowers under the kitchen table, shouldering an imaginary rifle and reliving his wartime terrors. Davey returns to Non and announces that he can no longer be her husband in the physical sense after betraying his marriage vows with a nurse called Angela. Non’s shocked and disappointed, even more so when she starts to see just how much Osian, the child Davey brought to her as an abandoned ‘foundling’ just a few days old, starts to resemble the man she married. With her husband cold and unloving, Non has her hands full dealing with a haridan of a mother in law, a mentally handicapped and possible illegitimate child under her roof and Davey’s children by his first marriage sometimes treating her as more of a servant than a mother, it’s a wonder she can keep body and soul together. Non has spent her whole life being careful about her health after her father, an allegedly renowned herbalist, diagnosed her with a weak heart and put her on daily drops of a herbal tincture. Non ‘sees’ things that she doesn’t want to – mostly sickness eating away inside others – and feels compelled to help where she can until her husband Davey orders her to stop. During the war her special herbal talents came in handy to help out local women ‘in trouble’ but she’s also adept at helping her nosey neighbour Mrs Ellis to stop her outdoor lavvy stinking or to settle her tummy troubles. The one person Non can’t help and most wants to help is her husband. When she finds a letter from Angela in Davey’s work clothes one washing day, she plots a trip to London to find out more about the man she lost and to search for a way to bring him back to her and back to life. 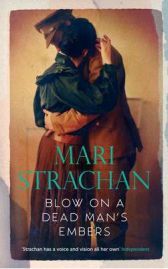 I wouldn’t normally read a family drama romance of this type – it’s really not my kind of book – but I enjoyed Blow on a Dead Man’s Embers much more than I expected to. Non is a compelling character, someone it’s hard not to care about and to empathise with. Despite her unwanted ‘gifts’ of healing and second sight, she’s not so Loony Tunes as to be hard to swallow. Her ability to adapt her dreams and ambitions to stay within the narrow path that’s offered to her is admirable and her determination to help not only her step-children and Davey’s mother as well as her adopted handicapped child shows a strength of purpose that belies her weak heart. Once a doctor reveals that her father might not have been entirely right with his diagnosis, the shackles are off and Non has a chance to rebuild her life but only if she can get to the bottom of Davey’s nightmares. As a picture of small town life in the early 1920s, Blow on a Dead Man’s Embers by Mari Strachan is a wonderful snapshot of time and place. When you couldn’t boil a kettle without setting a fire, or wash the laundry without using a dolly and a mangle, it’s an entirely different world from the carefree image we see more often of the world of the flappers and suffragettes doing their stuff in far off London. In places I found some of the Welsh terms hard to follow – Nain and Tain for grandmother and grandfather, Tada for father for example – but they soon dropped into place. This is the kind of book I can entirely imagine serialised as a BBC period drama which would top the ratings despite the absence of anything very racy or lurid. I’d also recommend it as a great gift for any relatives who like a more traditional and respectable story than tends to be the norm these days. This is a book whose writing is timeless and which you could pick up and read without any sense at all of when it was written, only a very clear one of when it was set. No Comments on "Blow on a Dead Man’s Embers"